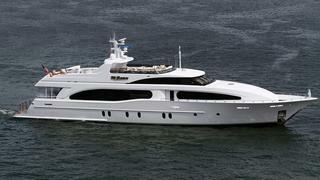 The 37.8 metre motor yacht Hi-Banx, listed for sale by Stuart Larsen and Trevor Carroll at Fraser Yachts, has been sold with Bob Cury at RJC Yachts introducing the buyer. Built in aluminium by US yard Broward Marine to ABS class, Hi-Banx was delivered in 2007 with a refit including a paint job in 2014. An interior by Evan K Marshall has cherry wood paneling accented by Carpathian elm burl and accommodates 10 guests in five cabins. These consist of a master suite with a king sized bed on the main deck, a VIP suite, two identical doubles and a twin, all with entertainment centres, flat screen televisions and en suite bathroom facilities. In addition, there are quarters for six crew in three cabins. The generous main saloon is full beam and has settees and armchairs forming several conversation areas and is complete with an entertainment centre including a 46-inch LED television screen with Crestron remote controls. A sofa and low cabinet separate the lounge from the dining area, which features a glass table with seating for 10 guests. Outdoors, the boat deck area can easily be transformed from tender storage to become a spacious area for sun loungers. A custom sunshade covers this deck from the radar arch to the helm position. Being full width, the flybridge offers an incredibly large entertainment area. Forward to port is a complete control station equipped with engine controls, monitoring, communications and navigation. To starboard forward is bench seating for guests while directly behind the port control station is a bar including a barbecue, icemaker, fridge and five stools. To starboard is a luxurious seating area with a built-in cocktail table, and under the arch is a dining table large enough for all ten guests, providing the perfect setting for al fresco dining. Twin 2,000hp MTU diesel engines give her a range of 1,450 nautical miles at 14.5 knots. Lying in Palm Beach, Florida, Hi-Banx was asking $6,500,000 and will be renamed Aquasition.